There are 3 types of strawberries - Spring-bearing, Ever-bearing and Day Neutral. 'Spring-bearing' strawberries are the traditionally grown strawberries that produce a single, large crop per year during a 2 - 3 week period. They are classified into early, mid-season and late varieties. 'Spring-bearing' strawberries produce many runners, their fruit are larger than the other 2 types, they produce their crop at once and it is used to make yam. They need space and will grow as a groundcover. 'Ever-bearing' strawberries are very productive and produce three periods of flowers and fruit during spring, summer and autumn. They do not produce many runners and instead focus their energy on producing multiple harvests. The fruits are usually somewhat smaller than those of the 'spring-bearers' and they are excellent to eat fresh. 'Ever-bearing' strawberries are ideal for gardeners who have limited space - they can be grown in terraced beds, barrels or pyramids. They can also be used as an edging plant or a groundcover. 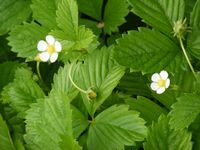 'Day neutral' strawberries are similar to the 'Ever-bearing' types - except that they do not produce runners and produce fruit ongoing throughout the growing season. Four to 6 plants will provide a handful of strawberries on a regular basis. They are ideal for edgings, in the rock garden, containers or narrow rows in the vegetable garden. 'Yellow Wonder Alpine' is classified as a 'Day Neutral' strawberry - it is a very productive variety that will bear fruit from spring until winter. Tiny white flowers appear all season, followed by small cone-shaped creamy-yellow fruit. It taste sweeter than the red varieties, has a strong sweet aroma and birds do not notice the fruit because of its color. It is both edible and ornamental. Yellow Wonder alpine strawberries do not produce runners - therefore they are ideal for edgings, in the rock garden, containers or narrow rows in the vegetable garden. 'Yellow wonder' requires a loose, loamy, slightly acidic soil (pH 6.0-6.5) and full sun. Strawberries will tolerate a variety of soil conditions as long as they have adequate drainage. All strawberries are prone to diseases caused by too moist soil conditions and overcrowding. Keep soil loose, plants must be properly spaced and ripe or moldy fruit must be picked daily. The leaves are included in blended herb teas. The fruits are eaten fresh, added to summer drinks, and made into jams, desserts, juice, syrup and wine. Strawberries are rich in pectin, fiber, vitamins A, B, C, E, potassium, calcium, iron, phosphorus and antioxidants. It is an appetite stimulant, astringent, antimicrobial, anti-oxidant and anti-inflammatory. A tea of the leaves treat diarrhea and mucosal inflammation of the mouth (as a gargle). The leaves and fruit are considered to be a cleansing diuretic for urinary tract disorders, rheumatism, gout and arthritis. Combine with St. John's Wort for mild arthritic pain, or with celery seed for gout. Young leaves have been used as a substitute for black tea and are sometimes taken as a bulking agent (filler) in medicinal herbal teas. The leaves are rich in flavonoids. Crushed strawberries have been a popular cosmetic remedy for centuries. Apply to whiten the skin and to remove freckles and clear acne. Apply it as an inexpensive face mask - it is a good toner and renovator. Apply it as an emergency treatment for mild sunburn. Apply mashed strawberries on skin cancer. Apply it over a ringworm infection and re-apply fresh daily. To whiten the teeth - rub strawberries over the teeth and leave on as long as possible before rinsing. Eat strawberries for gastritis and as a liver tonic after hepatitis. Strawberry juice shows anti-bacterial properties - was used in typhoid epidemics.